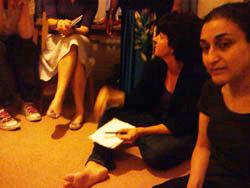 Mary Yacoob was joined at her flat in Seven Sisters by seven other participants in Remarkable and Curious Conversations for snacks, drinks and discussion from 7pm to 10pm on Wednesday 28th July 2010. The other artists were Claire Deniau, Joanna Hill, Ingrid Jensen, Lydia Maria Julien, Philip Lee, Steve Perfect, Cally Trench, and Imogen Welch. Many thanks to Mary. Great snacks and excellent conversation! Mary Yacoob writes writes: I really enjoyed the event, both as a social get-together and as an opportunity to exchange some feedback on each other's work. 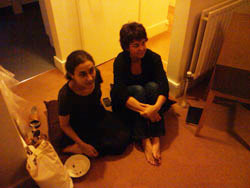 Philip and Joanna presented their new video works, Claire showed her new painting, and Ingrid talked about performative/documentary projects she is developing. Also Lydia gave out some cameras for her repetitive action project. Philip Lee writes: Again this time, the atmosphere at the Remarkable and Curious Conversations forum was really comfortable and so the discussions were productive and insightful. I found the discussion about my video was hugely helpful. I wish I had made notes from the start because I missed some early comments that, at the time, I found brilliantly perceptive. Then so much was said that I can't remember those early comments. Through the comments and questions I learned about why I was doing the work and why I had made certain decisions. It is very hard to think about one's work when one is steeped in it - literally in my case! Seeing it through other's eyes is essential and risky. Doing so in the context of the Remarkable and Curious Conversations forum with people whose opinions one respects and values is especially rewarding. Thank you all for your generosity and wisdom. I think that the sessions are successful because we know each other well and feel that we can say what we really think - both negative and positive. Everyone is very kind but still say whatever occurs to them. The unmediate but tactful comment is very worthwhile in my view. 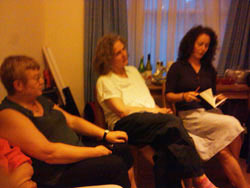 Joanna Hill writes: The Remarkable and Curious Conversations evening was interesting and refreshing. It creates a space for stimulating exchange of ideas, questions and issues around making work and is a good opportunity to get some critical feedback on work made or work in progress. 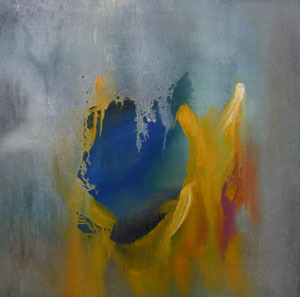 Often work is made in isolation until it is exhibited and it can be difficult to step back and take a fresh look. It's also interesting to hear how artists working in different mediums are approaching their work and the questions they are considering or dealing with. 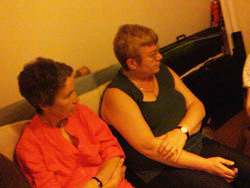 Claire Deniau writes: The evening was much more intense then I expected it to be. Everyone was enthusiastically participating and I have been really touched by the generosity of everyone in terms of feedback. To be in Paris, away from you all, alone in my studio is not always easy and the doubt is wandering around. To have the opportunity to show and discuss my painting has been extremely reassuring and encouraging. Also to be able to discuss the work of Philip; my comments might have been a bit 'latin' with Philip's video! 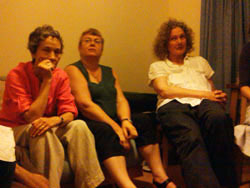 Joanna, Ingrid and Lydia seem to have woken up these challenging neurones that tend to go to sleep sometimes! Ingrid Jensen writes: The event at Mary's was really enjoyable - great company, fantastic food and thought provoking discussion and art. 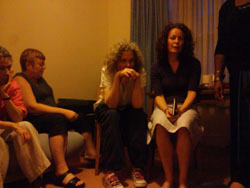 Conversations are not always straightforward, and sometimes participants are reluctantly drawn in - and they might withdraw offended or shut up completely if they thought one was playing with them. It's that "at play" thing where the game might be rather one-sided and a trifle mischievous. It's a very interesting way of looking at the world, which is one of the reasons I greatly value the opportunity to participate in Remarkable and Curious Conversations. Steve Perfect writes: I enjoyed the meeting very much again. Thanks to Mary for hosting. Going back to my previous notes about types of collaboration I think I identified a couple of new ones. 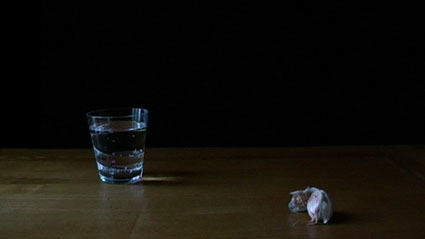 In Ingrid's Interface piece she asks her collaborators to carry out actions while her role is to record. In many ways this is similar (as a form of collaboration) to Lydia's Futility piece where collaborators carry out actions but document themselves, with Lydia editing the results. Ingrid's slightly subversive other piece is interesting because in some cases the collaborators may not know they are contributing. In this context the outcomes are presumably fairly benign, but the extension of without-knowledge collaboration into different areas could potentially be edgy and controversial. 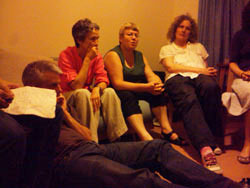 I was absorbed by Philip's piece and the reactions to it but didn't make any comments at the time. I think because his practice exists in such a different place from mine that it takes a while for me to understand my reaction in a way that I can put into words. I agreed with nearly everything that was said, or at least could see the points of view, but felt there was something else there, though I couldn't say what it was. I'm still not sure I can but suspect that it has something to do with being male myself, while all the responses were coming from women. There's a lot of (probably) macho stuff to do with sport and mud and the ability to withstand pain that all come together with Philip in an art context where it exists for me some where quite different. Lydia Maria Julien writes: Thank you to the artists at Mary's discussion who took a disposable camera to be guinea pigs for my project (working title Futility). This is only a test run until the proper black and white cameras come along. After being at the discussion, I will also be updating my project a little and providing more information and my aims for the interaction soon. 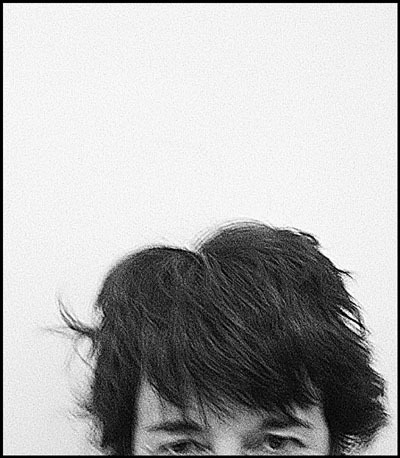 I also took photographs of the all artists present for my Messy Hair project. I found it so important to get together and discuss my own AND others' work. As arts funding seems to be suffering from cuts left, right and centre, being part of a network is so very important and it relieves the isolation that I believe we all feel as artists. 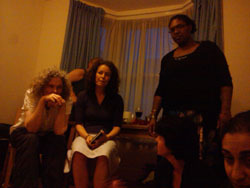 Imogen Welch writes: Despite my horrible lateness, caused by the North Circular, it was a delightful evening, a chance to meet some new Remarkable people and strengthen friendships with others. We tried to pack too much in inevitably but the range of what we did cover was huge, including performance, film, painting and photography. 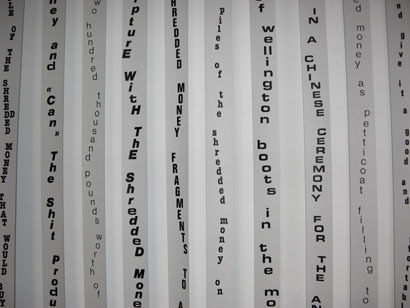 I had a brief opportunity to show a few people some snaps of my Shredded Money Project work (part of my current solo show in Poole); this is a very satisfactorily feedback loop as the original suggestions came from the group! Cally Trench writes: I think that it is the democratic nature of these discussions, that makes them so useful. It is really an ideal to be able to make or receive honest and serious comments in a warm and supportive atmosphere.